Your teeth have many friends: toothpaste, floss, fluoride, water, healthy foods, and of course, your North Oaks Dentist, Dr. Horn! 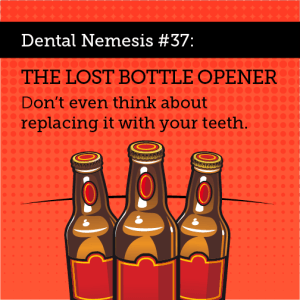 But did you know the health and well-being of your pearly whites could be under attack from dental enemies? ICE CHEWING. Ice on its own isn’t bad, but ice chewing can cause wear on the surface of teeth and can weaken enamel. If your teeth are already chipped or worn down, ice shards could crack and/or damage them further. DIET SODA. We regularly meet North Oaks dental patients that drink diet soda, believing it won’t have the same damaging effects on their teeth as the sugary stuff. The truth is that BOTH are bad for your oral health because of high levels of acidity. The acids in diet soda weaken and wear down tooth enamel, ultimately leaving teeth without a main source of protection. BOTTLE TOPS. 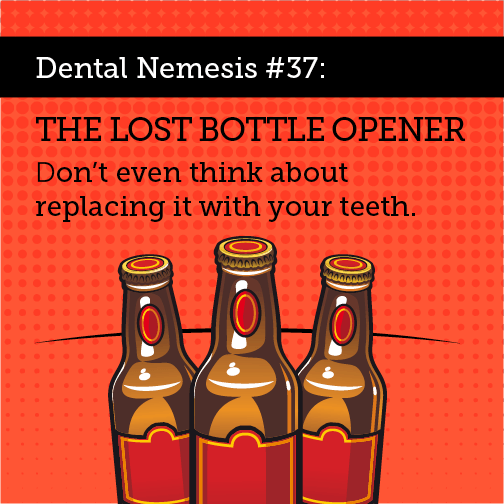 Don’t ever use your teeth to open beer or soda bottles. You could chip your teeth, scratch your gums, or even cause jaw joint problems. SUGARY SPORTS DRINKS. Like soda and diet soda, sports drinks are high in sugar content and acid, which could lead to cavities and excessive wear and tear. Skip the sports drinks and choose water instead. Finally, another dangerous dental enemy is skipping your regular dental checkups with your Dentist in North Oaks Dr. Horn! Don’t let your smile fall victim to these fierce dental foes – schedule your next cleaning by calling us at 651-288-3111 today!